There have been some updates to the look of this penthouse apartment since the photo. In my opinion it looks better now. I love the location. You can look out the large living room windows and see the Sacre Coeur. You can look out the little window in the lavatory and see what seems like all of Paris. Mornings with soft rain, accompanied by the opera singer practicing downstairs, make you feel like you're living in some romantic movie. In fact, maybe you are. This place exudes romance. I can't say enough good things about our stay at Erica's Rue Livingstone apartment. There are so many other categories that could also be rated a "10". The bathtub/shower was perfectly appointed. I'm certain that anyone would be pleased with the cleanliness of the apartment. The appliances and fixtures are all very nice and work without any nuances. I loved the windows- both the amount of light they let in and the ease of operation. Speaking of the windows, the view is, to say the least, inspiring. Sunrise is soft and sweet from the bed in the corner. The view of the Sacre Coeur is so much better than the pictures show. Actually, the whole apartment is so much better than the pictures. It's my opinion that it's bigger 'in person' than I was expecting. The only noises we heard that weren't our own were: the rain on the roof in the morning (how romantic) and the opera singer in the apartment below, also in the morning. I think she added that last speck of perfect romance to our engagement trip to Paris. We had heard (from friends, family) that it was difficult to get a taxi, especially weekends and evenings, but we never once had any trouble, no matter the day or time. The location was such a great suprise. 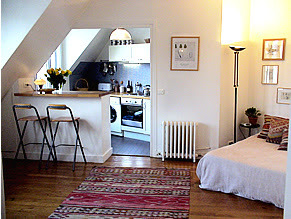 This apartment is just a hop away from the bottom of the steps to the Sacre Coeur. (that's a great help in telling the Taxi drivers where to take you, since, when you say "Rue Livingstone they seem to be/stay lost.) We found the most charming man in the little cafe at the bottom of the steps. The single thing that makes this apartment (or any of Erica's rentals) the BEST place to stay in Paris is the kind of attention offered by this team. Erica was always so fast to respond to any email we sent, and once we arrived, Isis was the warmest, most wonderful hostess I've ever encountered. She was thorough and sweet. I felt reassured that if we needed assistance of any kind she would take good care of us. Anyone running a business could learn how to treat people by taking a lesson from this team - they really have that special something. We would stay again and again, and we'll definitely spread the word.